The Hotel Leaders Network (HLN) is an exclusive network platform for General Managers, Hotel owners, Hotel Managers, CEO’s and Regional Directors working in the hotel industry. Once a year the HLN will organize a refreshing event on an inviting location. Here, inspiring guest speakers and presentations will enlighten you with the latest trends, innovations and developments within the (inter)national hotel industry. The HLN provides the opportunity to expand one’s network with colleagues in senior hotel management. Grab the chance to exchange views, experiences and ideas in a informal atmosphere. The HLN is an initiative by Melle Pegman and Jacob de Graaff. 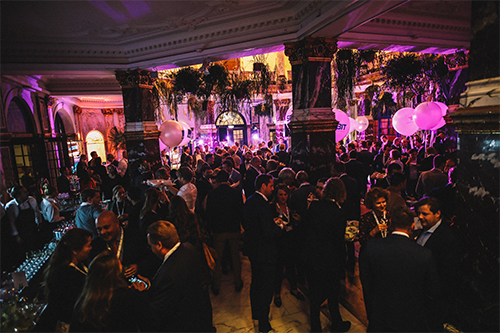 Both founders of the most successful networking event within the Dutch Hotel Industry: Hotelvrijmibo (since 2007) This event has around 800 attendees, only hoteliers. On the 16th November 2018, the 4th edition of Hotel Leaders Network has been organized. This time the networking event took place at the KIT Royal Tropical Institute in Amsterdam. After being welcomed in the beautifully decorated Marble Hall, everyone moved to the Queen Máxima room for the very first Hotelrede by Jort Kelder. This edition, The Hotelrede has been introduced. The Hotelrede is an annually recurring element in which a prominent Dutch person shares an outsider’s view of the hotel industry and holds up a mirror, stimulates and inspires them. After the Hotelrede, it was time for some networking while enjoying live music, drinks and the walking dinner. Click on the button below to see all previous editions. We have a number of passionate board of advisory members whom we highly value. They all work in the management in the hospitality industry. They have a large network and know the business well. ‘It’s lonely at the top’, but it doesn’t have to be!